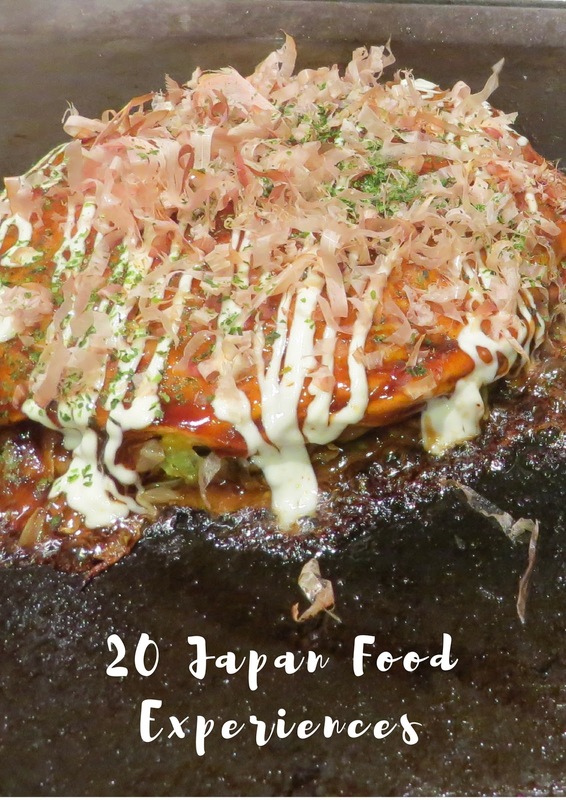 Food memories always linger the longest for us and this was no exception on our trip to Japan. 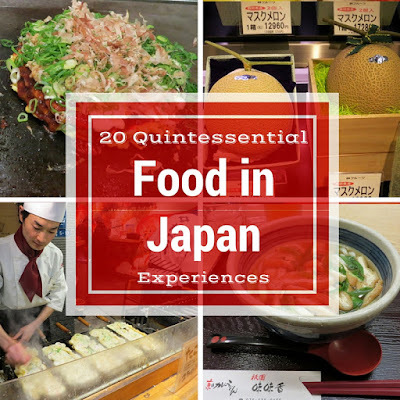 I counted no less than 20 Japanese food experiences worth sampling if you find yourself in Tokyo, Kyoto, or Osaka. Here are the highlights plus reasons why these particular experiences were culturally interesting, unusual, or just plain tasty. Japan has a gift-giving culture that is both subtle and over-the-top. In terms of subtlety, there are rules that govern gifts to give that are dependent on the occasion, status of the gift giver, and whether you are reciprocating. If you are new to the country, the etiquette can be baffling. At the same time, the gifts themselves can be totally over-the-top and this is all too apparent if you take a stroll through the produce section of the local department store. My jaw dropped when I saw a price tag of nearly 5000 yen (~40 USD at the time of writing) for a package of 6 apples. 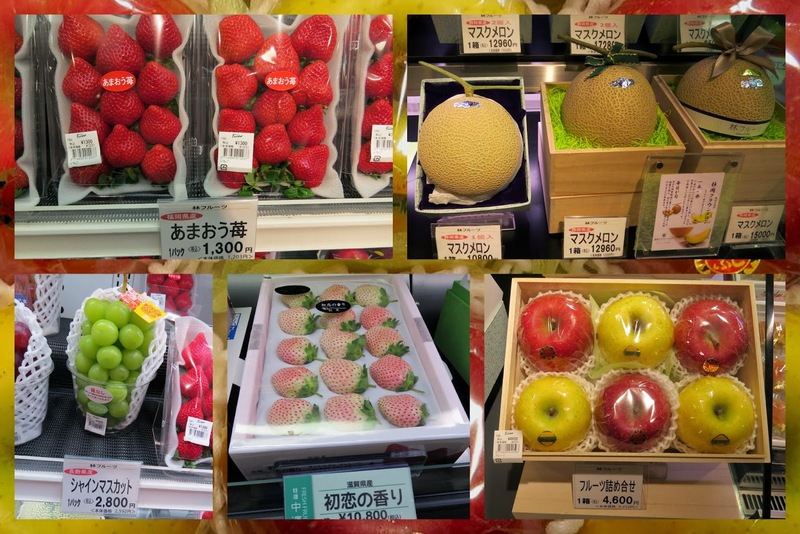 I was even more stunned to see a single melon priced at 12800 yen which translates to over 100 USD. Apparently, it's not about the fruit but about the status and honor bestowed upon the recipient and the favored curried for the gift giver. We were curious and tried a single nice looking apple that cost the equivalent of about 5 USD. It felt so fancy that we ate it with a knife and fork. It was good but then again, the ones we get in the US and Ireland for less than a couple dollars a pound are fine by me. I have to keep reminding myself that it's not about the fruit. 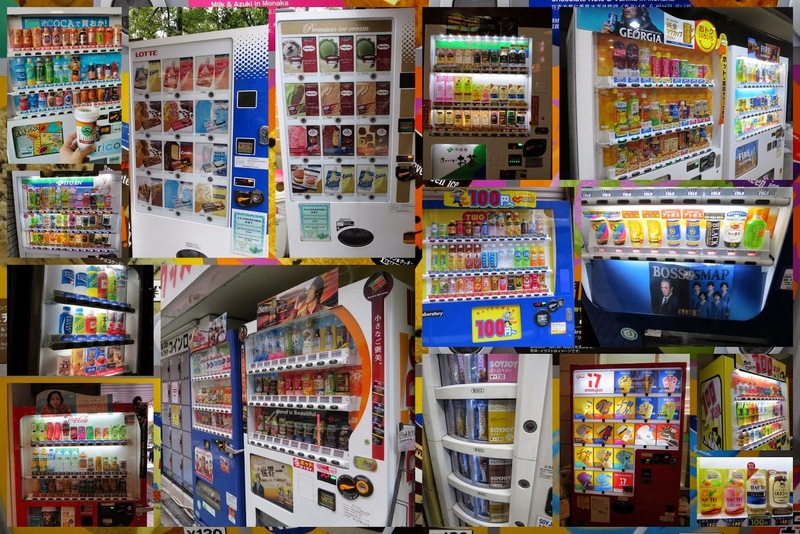 There are vending machines everywhere in Japan featuring everything from soda to snacks to hot and cold coffee to ice cream and beer. We heard that in some neighborhoods you can find more exotic vending machines featuring used undergarments and the like but those are much more hidden from prying tourist eyes. We found that the vending machines were a nice way to peruse various products and inevitably used them to secure breakfast in the morning (hot or cold coffee in a can) and to have a drink in the evening. Many bars have a pricey cover charge so if you want a single beer, the vending machine is the most cost effective way to go. Japan can feel a bit intimidating to the first time visitor and the pressure of being greeted at a restaurant by an over-eager waiter and then struggling to read the menu and communicate an order can be quite stressful. That's why I loved the ticket machine restaurants. The first time we saw one, we were able to observe a local at a distance to understand the protocol. Basically, you press the items that you want (usually there are helpful photos so you know approximately what you'll be getting), feed money into the machine, take the ticket it spits out, go inside and hand it to the waiter/waitress who will show you to a table. The food magically appears less than 10 minutes later. When you're finished, there is no awkward process of asking for the bill because you've already paid. Everything tastes better coated in batter and deep fried. The Japanese must believe this, otherwise, how can one explain tempura. Battered deep fried vegetables or seafood are a must-try side dish with your meal. 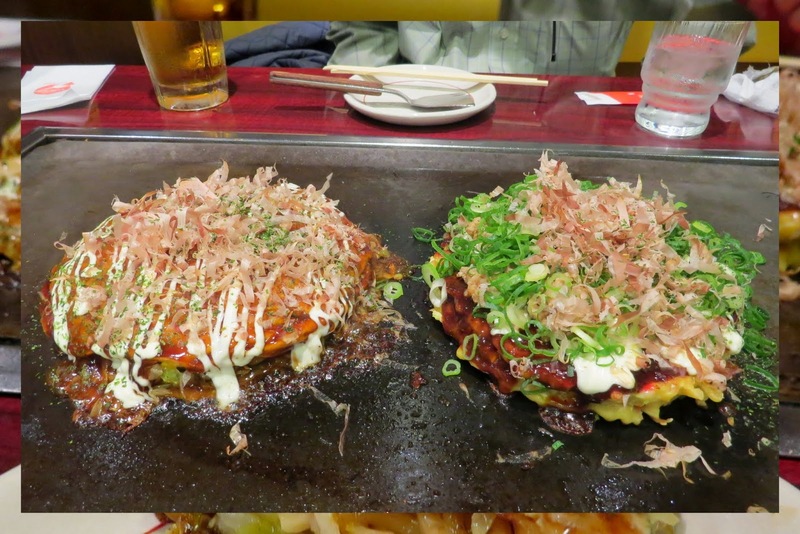 Okonomiyaki was absolutely our favorite food experience in Osaka. We sat down in front of a grill and a large menu was placed in front of us. We selected the picture of the one that looked best to us. 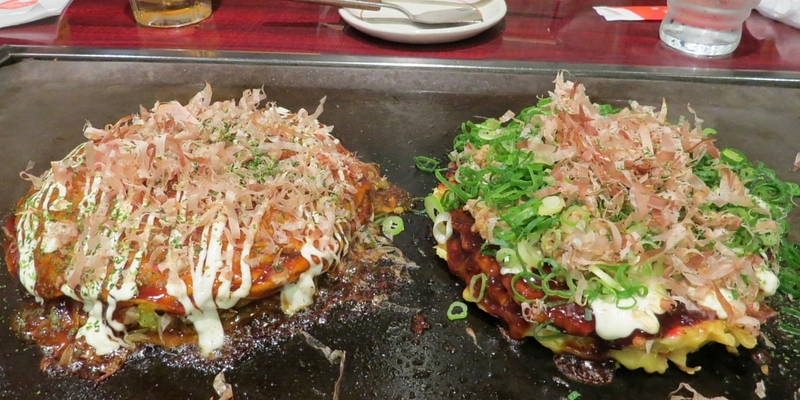 Okonomiyaki is kind of like an omelette, kind of like a pancake. It features all manner of ingredients from eggs to noodles, to cubes of meat and seafood. The dish is then topped with something like mayonnaise and a soy based barbecue sauce. The whole thing is then smothered in bonito (fish) flakes. It tastes way better than it sounds. It all came together before our very eyes. 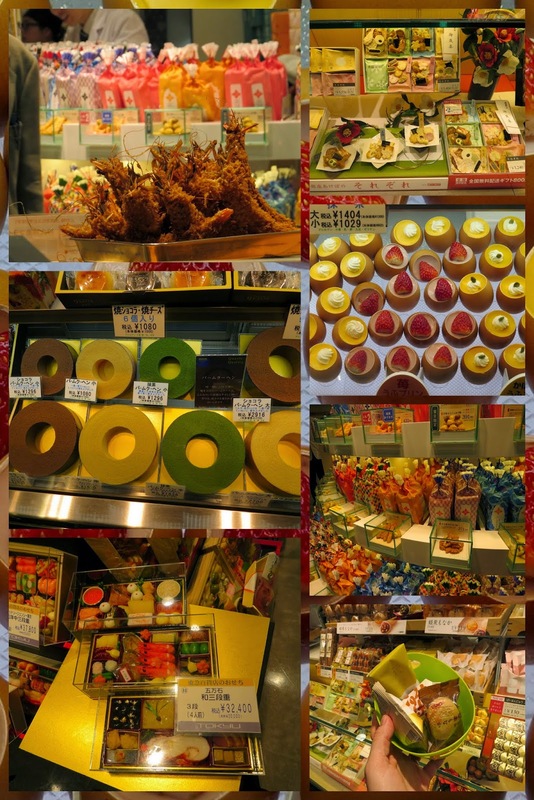 Japanese department stores are a treasure trove of decadent treats. Tying in with the gift giving theme, there are many options for packaged sweets and savories. Even if you don't have someone to buy a gift for, buy a gift for yourself in the form of a little something nice to snack on. We love visiting supermarkets whenever we travel. We typically find interesting, unusual, and sometimes downright weird items to try and they are way cheaper when not bought at a tourist trap. 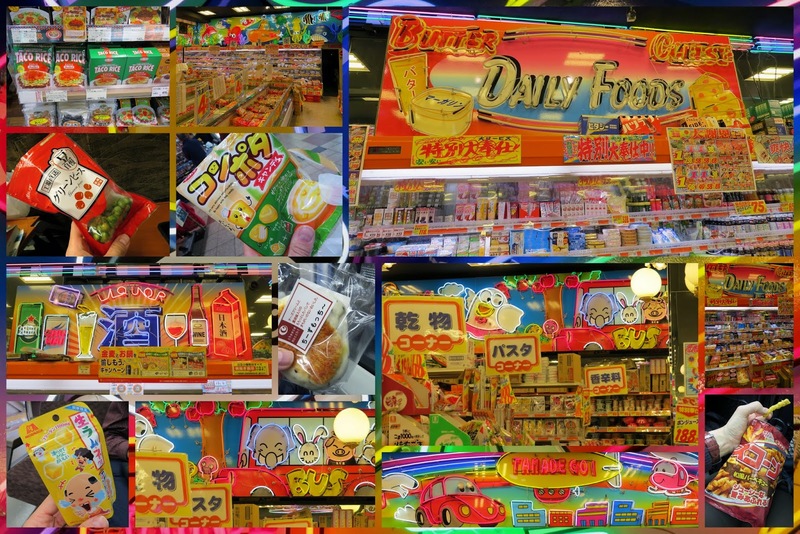 We visited a grocery store in Osaka and the place itself was a bit overstimulating with all manner of neon and blinking lights. We quickly got beyond this though and picked up some treats including savory soy crackers, salted peas, gummy mango cubes, and corn candy. A bento box is ideal for lunch on the go. Various meats and side dishes sit in little compartments on a tray. They can be found in all the major supermarkets and department stores. 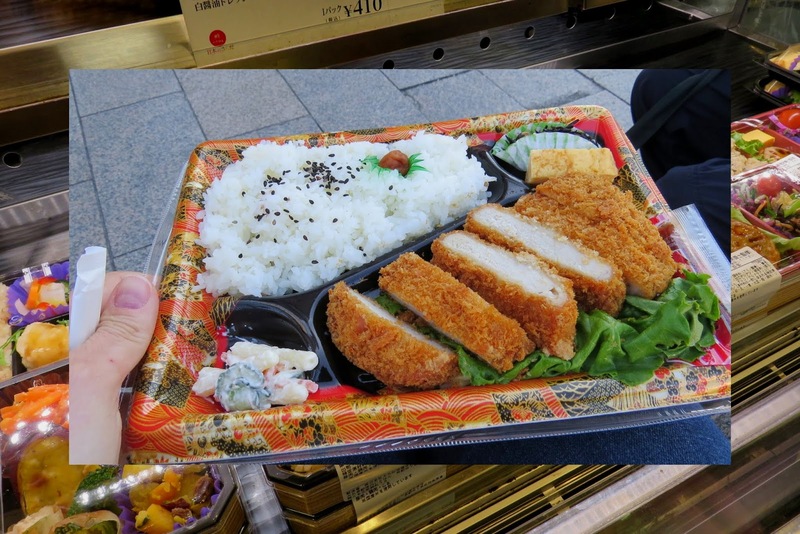 Known locally as o-bento (the 'o' is honorific), you can see just how much value the Japanese places on these super convenient and super tasty meals on the run. We aren't huge sushi aficionados so going to a really expensive place would be lost on us. The 'Sushi Go-Round' experience was perfect for us instead. You basically sidle up to a station equipped with sauces, hot water spigot, and green tea power. The sushi comes around on a conveyor belt with the price denoted by the color of the plate. The sushi chef stands in the center presiding over the whole affair. You simply pick whatever looks interesting and give it a go. At the end, the waiter tallies up your stack of plates and presents you with a bill. We definitely have a major sweet tooth. In Japan, we sated it with momiji manju, steamed buns stamped in different shapes and filled with cream, green tea paste, red beans and more. On Miyajima Island, they took momiji manju to a whole new level. We found the maple leaf shaped treats in at least ten different flavors. I am a bit of a collector by nature so had to buy them all to try. Fortunately, they cost less than 1 USD apiece. 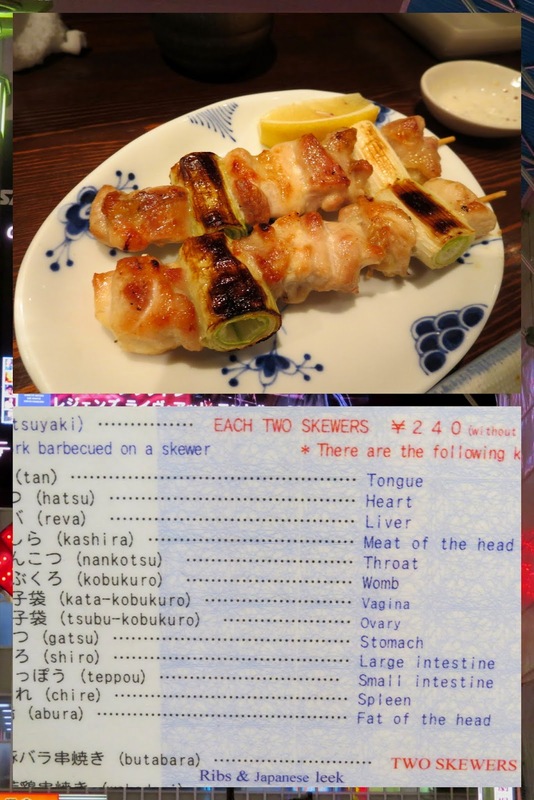 An Izakaya is a Japanese bar where people often go after work. Beware that the places tend to be smoky and there is typically a cover charge for drinking beer. However, it's worth it to go once for the more local experience. Have a beer and a snack and do a bit of people watching. 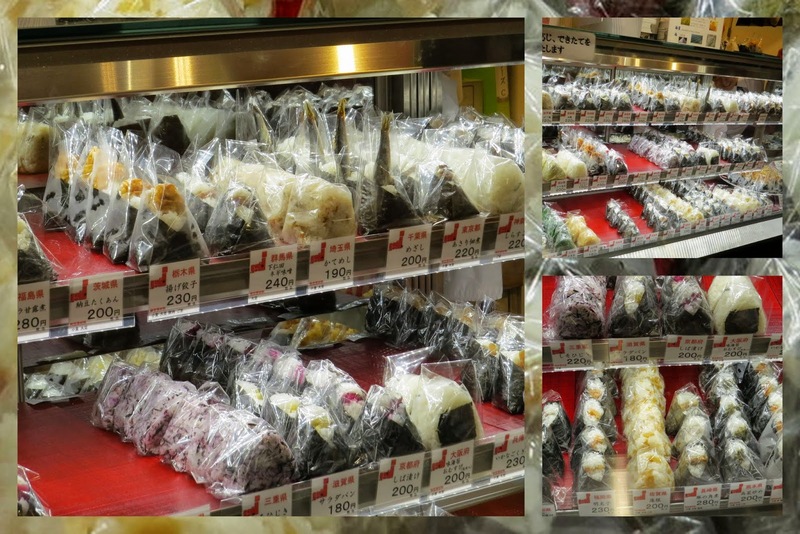 Onigiri are really handy for long train rides and can be found in all manner of flavors in the convenience shops at the train station. Onigiri are hand-held rice snacks optionally coated in a seaweed wrapper. Flavors range from egg to bean paste to salmon and shrimp. They are a filling snack to take on the road. 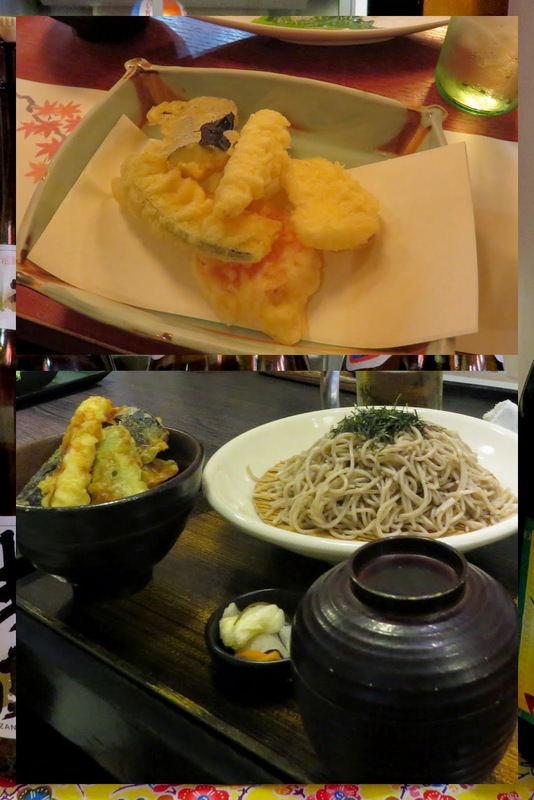 We discovered Okinawan Cuisine at a restaurant in Roppongi Hills in Tokyo. Okinawa belongs to Japan but is more similar to Hawaii in its culture and influences. We pointed to an item on the menu and didn't quite get what we expected. A plate of rice, ground meat, cheese, and lettuce arrived in front of us. I thought, 'hmm...this looks more like a taco than something Japanese'. We whipped out out our Google Translate App and learned that it was actually Taco Rice. I thought that we might have accidentally ordered a dish for squeamish western tourists. A quick Google search later confirmed that this was indeed actual Okinawan Cuisine. The dish was invented in the mid 1980s and is popular among U.S.military personnel stationed in Okinawa. Looks like a bit of cross-cultural pollination going on. 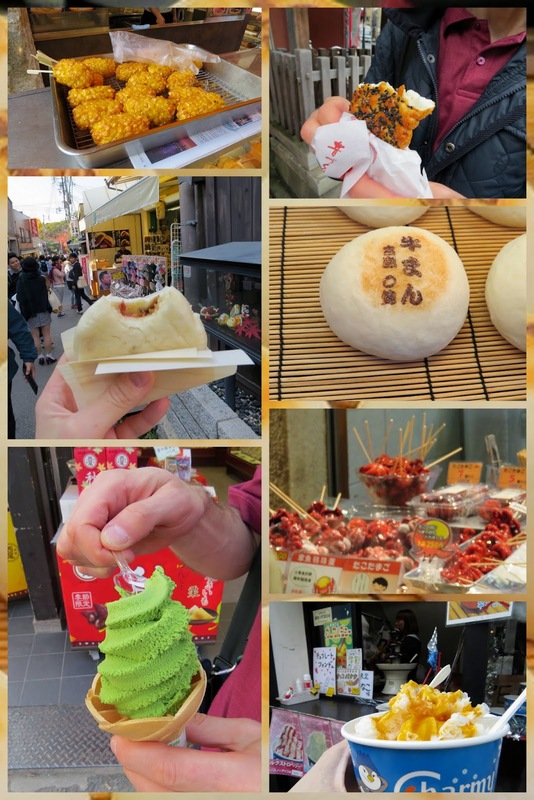 Nearly everywhere we went, we indulged in street food treats from corn fritters near the Tsukiji fish market, to steamed pork buns to octopus on a stick and green tea ice cream. We were spoiled for choice with so many temptations when we were out and about. 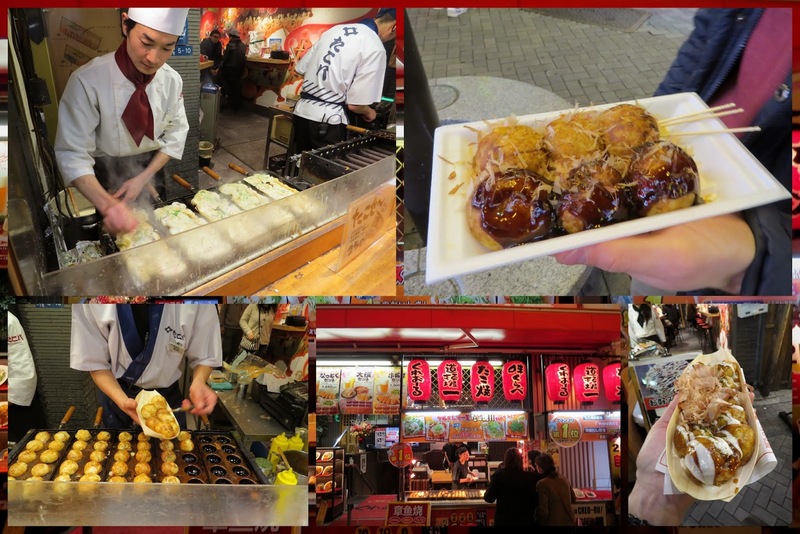 Takoyaki (octopus dumplings) are an Osaka specialty. They are made with utmost care and attention along the street with the 'chef' painstakingly swirling and flipping the batter until it goes from flat to a perfectly round shape. The whole thing is then smothered in a barbecue sauce and topped with bonito (fish) flakes. They are worth the wait. 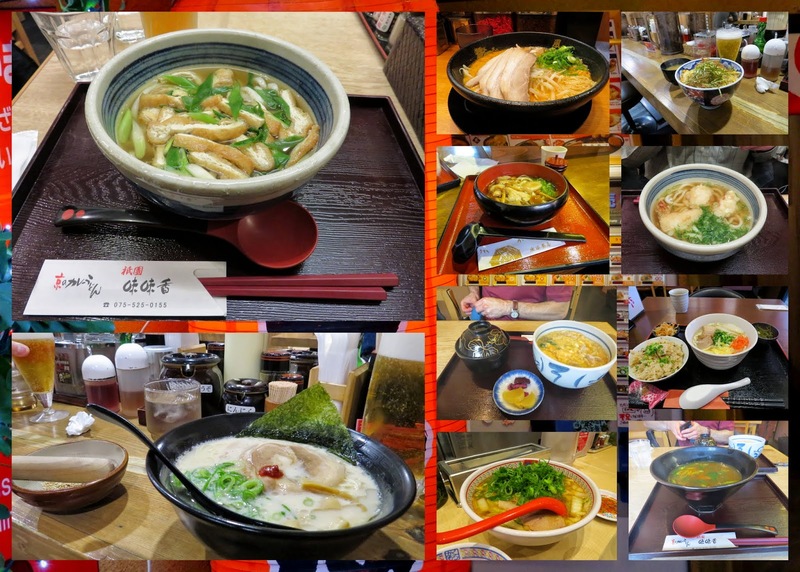 Japanese noodles were my favorite dish and we sampled spicy, savory soups again and again on our trip. From thin ramen noodles to thick udon, we slurped away with satisfaction everywhere we went. 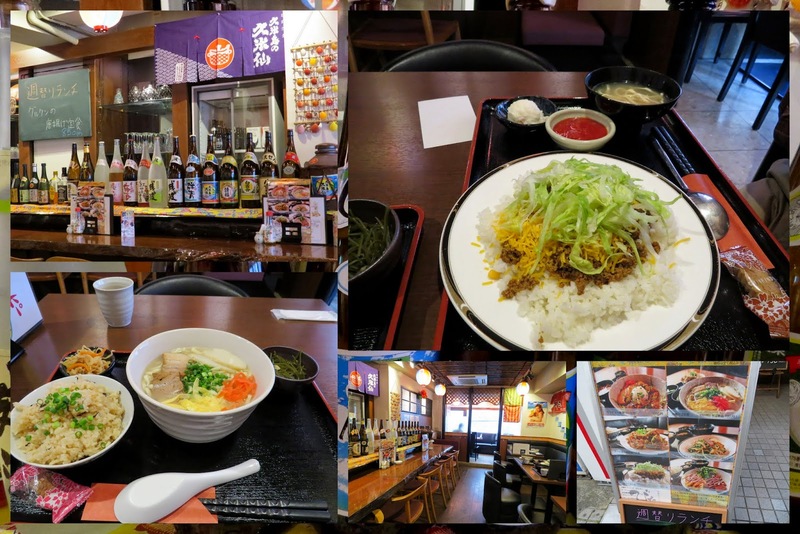 For recommendations on the best udon in Tokyo, check out this post on The Social Travel Experiment. 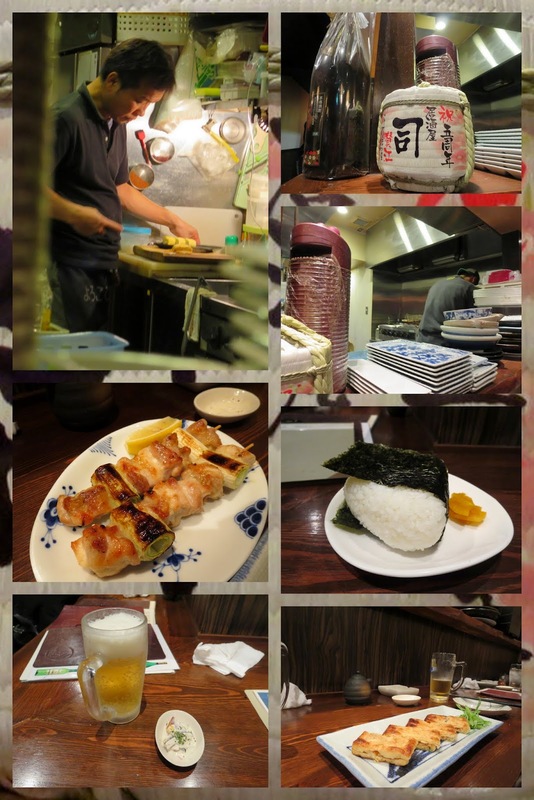 We tried just one 'upscale' restaurant experience while in Japan and that was in Kyoto. 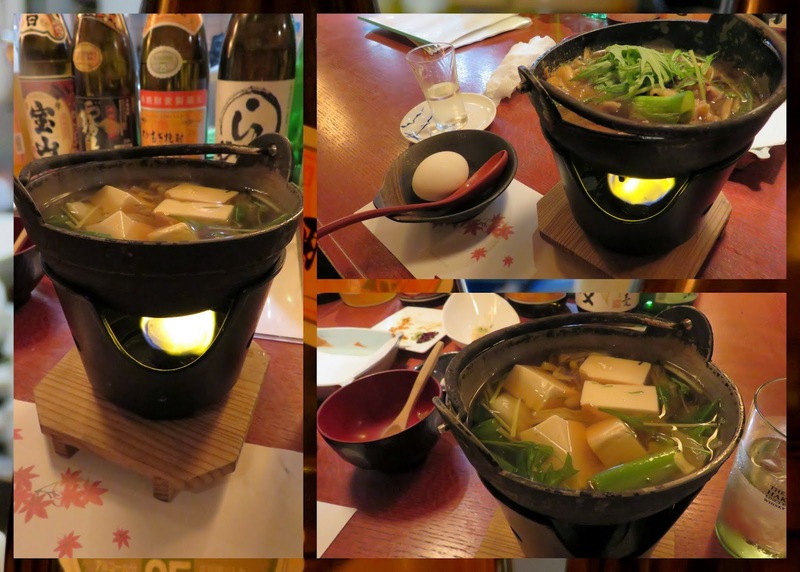 The restaurant served several courses but focused on Sukiyaki which is comprised of meat or tofu in broth with a raw egg on the side. The whole dish sits atop a flame that cooks everything and keeps it hot. Beware, this dish is extremely hot and there is a serious risk of burning the roof of your mouth if you let your impatience to sample the deliciousness get the better of you. In Nara we were wandering through a forest dotted with temples. The Autumn foliage was at its peak around us. 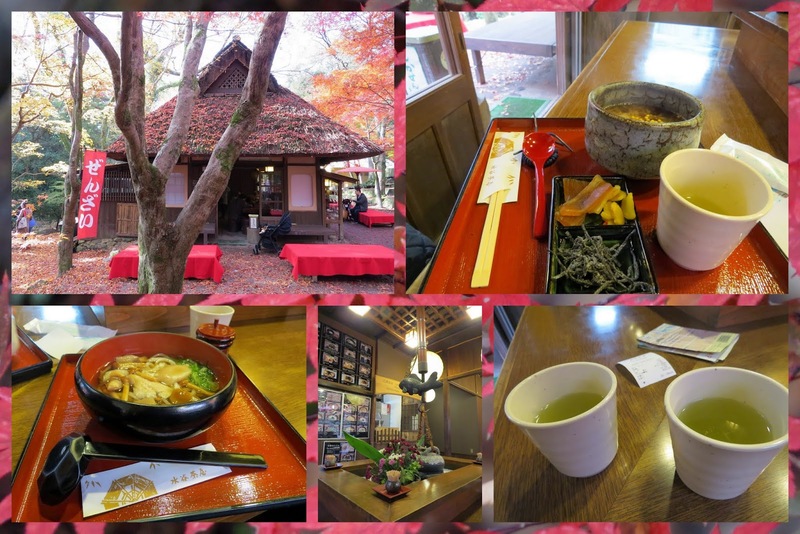 We were starting to get hungry when a small tea house appeared in front of us. 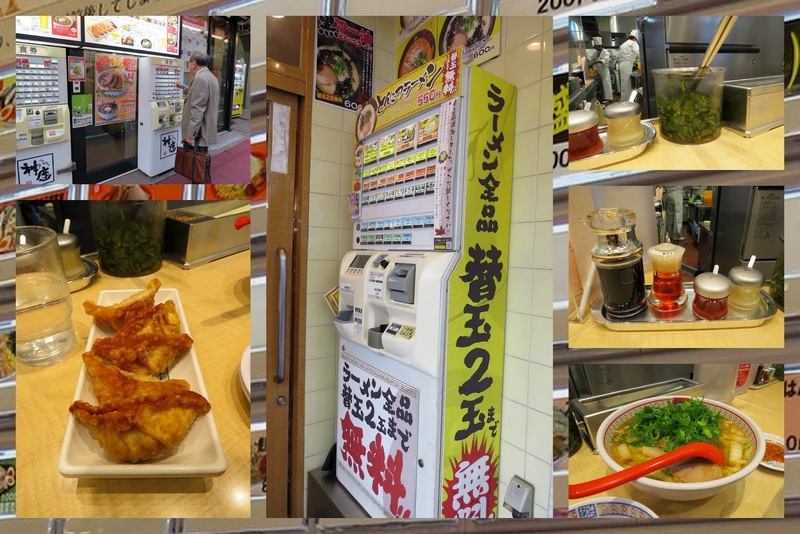 We sat down inside for a bowl of noodles and free green tea from a self-service vending machine. It was an idyllic and charming place and the food wasn't bad either! The surroundings make all the difference. 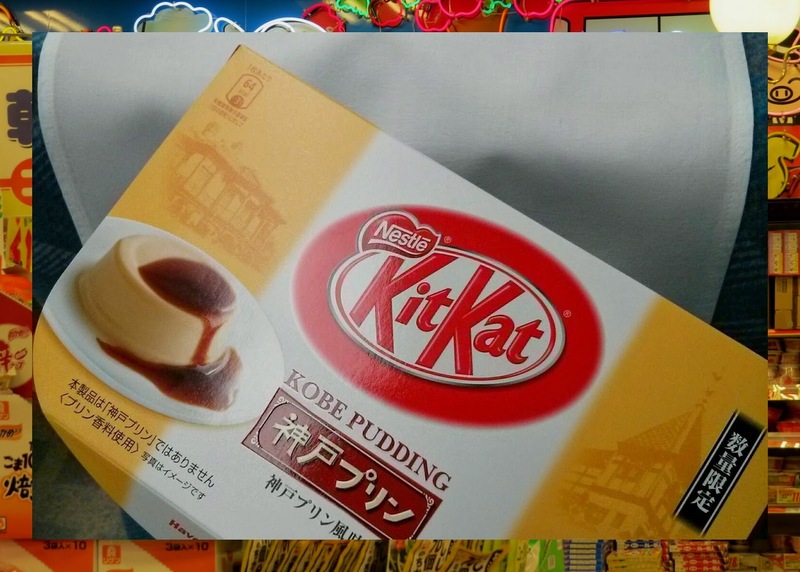 The Japanese seem to be obsessed with Kit Kat candy bars. They come in all sorts of limited edition flavors like wasabi and kobe pudding with prices to match. I've mentioned before that I have the 'collector gene'. In this case, I managed to resist the temptation to buy one of each kind mainly because the small packages were about 3-4 USD each and the large ones more than 8 USD. I hope you've enjoyed reading about the wide range of food experiences available in Japan. Are there any that we've missed in your opinion? It's always good to have an excuse to go back and visit again! 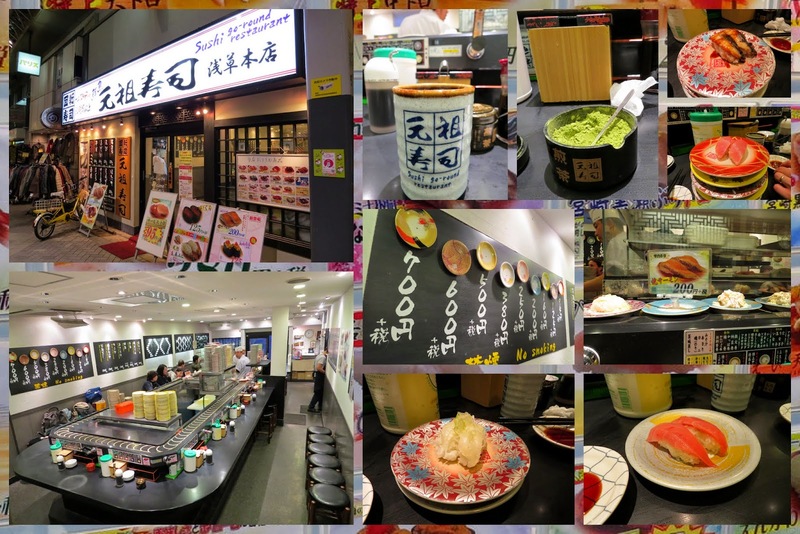 Read about cool Japan food experiences on a trip to Tokyo, Kyoto, and Osaka. 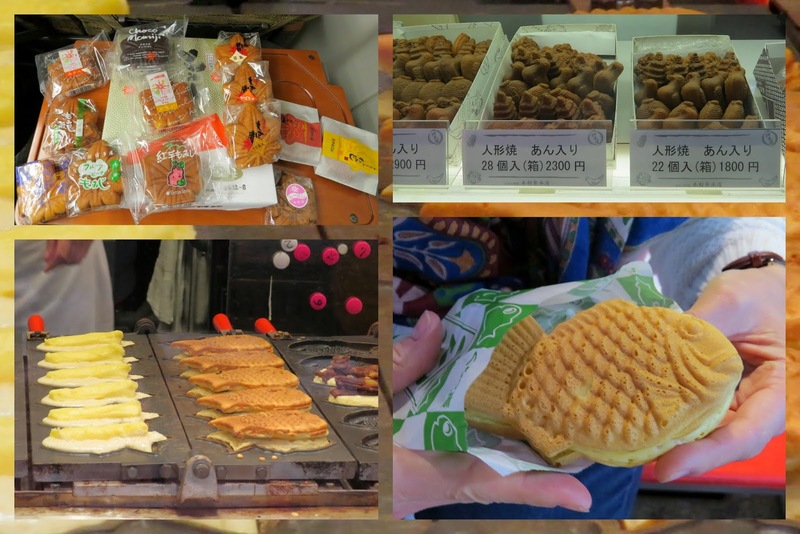 Learn about what to eat in Japan on vacation.